NORFOLK, Va. – Navy Machinist’s Mate (Nuclear) 1st Class Bradley Rumann, (right), a Loon Lake, Washington, native, was selected as 2018 Sailor of the Year serving aboard USS Columbus (SSN 762). 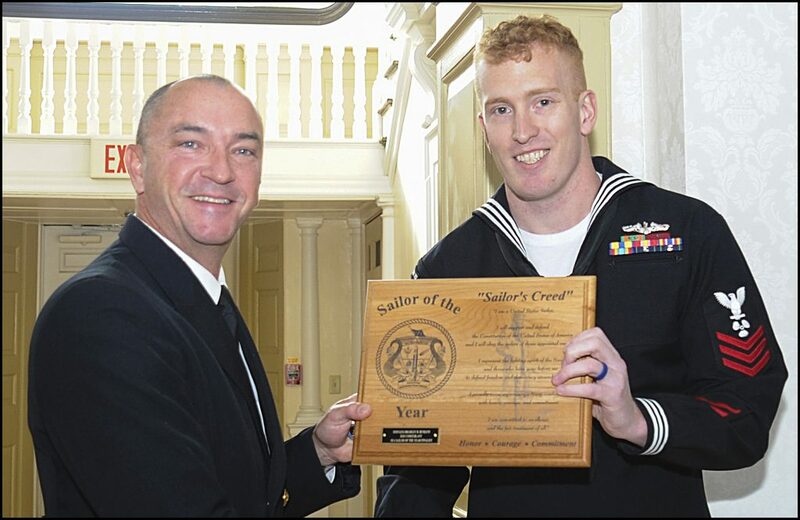 Sailors that show outstanding initiative and commitment to the Navy’s mission and teamwork are selected as Sailor of the Year after standing before a board of senior sailors. Rumann most certainly does that by working diligently as the lead nuclear mechanic, quality assurance petty officer and the boat’s command career counselor. Rumann is a nuclear mechanic for the submarine, working tirelessly to maintain the boat’s engines, pumps, turbines and air conditioning. Preparing for a deployment means numerous exercises and underways to ensure the boat’s war fighting capacities are at one hundred percent. The sailors sacrifice time with their families to serve their country by keeping our submarine force the strongest in the world. Rumann joined the Navy to follow in the footsteps of his grandfather and uncle and to see the world. He is especially glad that he joined for the camaraderie that comes with being a submariner. The USS Columbus is a flexible, multi-mission platform designed to carry out the seven core competencies of the submarine force: anti-submarine warfare, anti-surface warfare, delivery of special operation forces, strike warfare, irregular warfare, intelligence, surveillance and reconnaissance and mine warfare, It’s 377 feet long and 34 feet wide and weighs nearly 7,800 tons, powered by a nuclear reactor to push the boat through the water at speeds of more than 25 knots while submerged. As the most modern and sophisticated attack submarine in the world, the submarine can operate in both littoral and deep ocean environments and presents combatant commanders with a broad and unique range of operational capabilities.